Jost Amman is considered as one of the best professional wood-engravers in Germany between 1560 and 1590. After Amman wood-engraving rapidly declined in Germany and was more or less outmoded by copper-engraving. Amman’s wood-engravings are full of detail, particularly in the famous ‘Ständebuch’, and the interiors of workshops etc. have the tools and appliances clearly drawn. 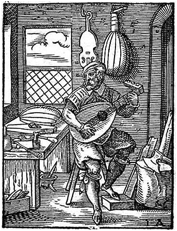 Amman made several very interesting wood-engravings concerning the lute. Among the most famous and sought-after is the one of a lute maker in his workshop. Jost Amman (also spelt Jost Amann, Jost Aman, Jodocus Ammonn, Justus Ammon, Jobst Amman, Jodocus Amman and Jost Ammann) was born on 13 June 1539 in Zürich . Jost was the youngest son of the scholar and choirmaster in Zurich, Johann Jakob Amman, a friend of Ulrich Zwingli and Konrad Gessner. Jost studied at the Collegium Carolinum where his father was a professor. As his brother Josua (1531–64), who became a goldsmith, Jost did not take up a scholarly career but was apprenticed to a painter of stained-glass pictures in Zürich. As a journeyman Jost arrived in Basel in 1559, where he worked as ‚Visierer‘ or ‚Scheibenrißzeichner’, which means that he made original sketches, drafts and drawings on order and from requirements from customers. The draft was then passed to the engraver or painter, sculptor etc. who worked from the draft. Amman may have spent some time in France, since his early works show a close resemblance to French book illustrations. Amman moved to Nuremberg about 1561, where he worked with Virgil Solis (1514-1562) and was taught wood-cutting and etching. Virgil Solis was one of Nuremberg's most productive printmakers and book illustrators. After Solis's death in 1562 Amman took over his workshop and the partnership with Solis's publisher, Sigmund Feyerabend. In 1577 Amman became burgher of Nuremberg and by 1581 he was well established and famous. Jost Amman died on 17 March 1591 in Nuremberg. 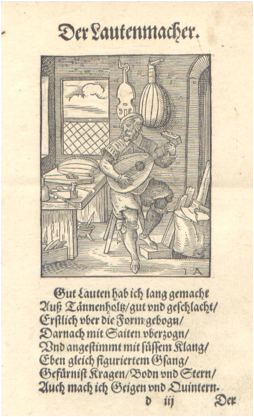 The wood-cut ‚Der Lautenmacher‘, shows a lute maker sitting in his workshop, maybe trying out a newly finished lute of the 16th century type or just taking a musical break from his daily work. 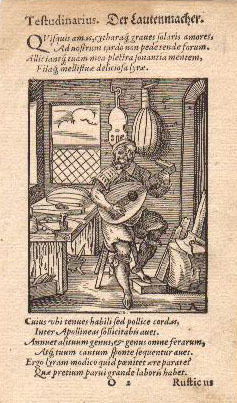 The scene may indicate that lute makers actually also played their instruments, A tenor (?) viol and a lute without pegs hang on the wall and there is a lute mould or lute back on his carpenter’s workbench. Other items in the workshop are a chopping-block with an axe, two planes, two chisels (? ), a gluepot with a brush and some timber. This wood-cut was printed in at least two variants during the 16th century. The first edition of the wood-cut appeared in the ‚Ständebuch‘, or as its original title sounds, ‘Eygentliche Beschreibung Aller Stände auff Erden / Hoher und Nidriger / Geistlicher und Weltlicher / Aller Künsten / Handwercken und Händeln / u. vom grössten biss zum kleinesten / Auch von jrem Urspung / Erfindung und Gebreuchen. Durch den weitberümpten Hans Sachsen / gants fleissig beschrieben / und in Teutsche Reimen gefasset / Sehr nutzbarlich und lustig zu lesen / und auch mit künstreichen Figuren / deren gleichen zuvor niemands gesehen/ allen Ständen so in diesem Buch begriffen / zu ehren und wolgefallen / Allen Künstlern aber / als Malern / Goldschmiden / u. zu sonderlichem dienst in Druck verfertigt’, Frankfurt am Main: Georg Raben, in Verlegung Sigmund Feyerabents, 1568. A Latin version of this was published the same year by Feyerabend but under the editorship of Hartmann Schopper: 'Panoplia, omnium illiberalium mechanicarum aut sedentaiarum artium genera continens...' Another later print, with the original German text, obviously printed with new types but probably using the same block as the first edition, was „Gedruckt in Frankfurt von Paulum Resselern in verlegung Sigmund Feyerabends 1574“. The ‚Ständebuch‘ describes in 114 wood-cuts most of the important professions and trades of the 16th century and the magnificent and well executed pictures illustrate typical activities. Each illustration is accompanied by an eight line verse by Hans Sachs. The book seems to have been much in demand as a second edition was published in Frankfurt by P. Reffler für S. Feyerabend, 1574. This seems to be an unaltered version of the first edition. Aller Stände...', 1568 (in the author's collection). Aller Stände...', 1574 (in the author's collection). Auch mach ich Geigen und Quintern. The connection between the text and the picture is quite clear and consistent. This is not entirely the case with the Latin text which is given in Hartmann Schopper’s 1574 version, where Jost Amman’s wood-cuts from ‘Eygentliche Beschreibung Aller Stände auff Erden…’ reappear. Hartmann Schopper’s book, ‘De omnibus illiberalibus sive mechanicis artibus, humani ingenii fagacitate atque industria iam inde ab exordio nascentis mundi usque ad nostram aetatem adinuentis, luculentus atque succinctus liber. Frankfurt am Main, Georgius Corvinus for Sigmund Feierabend, was first published in 1574. It seems to be the same original wood-cut by Amman that was used for this new book, but the accompanying text is completely different and from some aspects less interesting. Schopper’s book was reissued in 1584 with the same pictures and text. The Latin text is identical in Schopper's 1568 edition of 'Panoplia...'. illiberalibus sive mechanicis artibus..., 1574 (in the author's collection). Ergo lyram modico quid paenitet aere parare? Quae pretium parvi grande laboris habet. Érgo lyrám modicó quid páenitet áere paráre? Quáe pretiúm parví | gránde labóris habét. Hurry up to come to our place! And birds will voluntarily comply to your tune. So, why not acquire a lute for a modest price? It can provide great reward for little labours. strebe leichten Fusses zu unserem Orte! ebenso der erquickende Saitenklang der süßen Laute! und deinem Sang werden die Vogel folgen von selber. Was also hindert, um mäßigen Preis eine Laute zu erwerben? Geringe Mühe kann sie reichlich belohnen. (Comments: The Sun is Apollo. Signs, literally birds, of Apollo are his attributes, i.e. the sun or the lyre or, in a more abstract way, Art and Music. Follows a pun: signs (= birds/aves) - winged gender - any other wild creature - birds. Animals obeying a musician reminds of Orpheus and/or Arion.). (I kindly acknowledge my debt to Matthias Rösel, who has both given a corrected version of the Latin text, as well as translations into German and English as well as valuable suggestions). 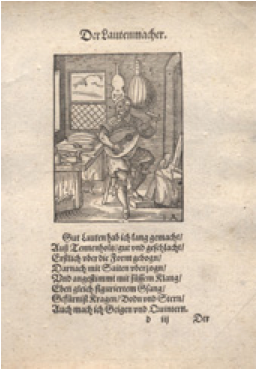 The Schopper version of the text is of a more advertising type, but at least suggests that Amman’s contemporaries could acquire a lute at a modest price! I’m most grateful to Matthias Rösel and Michael Fleming who have made valuable observations etc. to this article. Eygentliche Beschreibung Aller Stände auff Erden, Hoher vnd Nidriger, Geistlicher vnd Weltlicher, Aller Künsten, Handwercken vnd Händeln, &c. vom größten biß zum kleinesten, Auch von irem Vrsprung, Erfindung vnd gebreuchen. Leipzig: Edition Leipzig, 1966. Nachdruck der Ausgabe Frankfurt/Main, 1568. Sachs, Hans. Eygentliche Beschreibung Aller Stände auff Erden / Hoher und Nidriger / Geistlicher und Weltlicher / Aller Künsten / Handwercken und Händeln / u. vom grössten biss zum kleinesten / Auch von jrem Urspung / Erfindung und Gebreuchen. Durch den weitberümpten Hans Sachsen / gants fleissig beschrieben / und in Teutsche Reimen gefasset / Sehr nutzbarlich und lustig zu lesen / und auch mit künstreichen Figuren / deren gleichen zuvor niemands gesehen/ allen Ständen so in diesem Buch begriffen / zu ehren und wolgefallen / Allen Künstlern aber / als Malern / Goldschmiden / u. zu sonderlichem dienst in Druck verfertigt., Faksimileausgabe der Originalausg. aus dem Jahre 1568., mit vielen Abb., (Holzschnitte)., Hanau, Müller & Kiepenheuer, 1966. The book of trades (Ständebuch) [by] Jost Amman & Hans Sachs. With a new introd. by Benjamin A. Rifkin. New York, Dover Publications  l, 127 p. illus. 22 cm. Note Reprint of the author's Eygentliche Beschreibung aller Stände auff Erden published in 1568. "The following English-language material has been specially prepared for the present edition: a preface and introduction (with 26 additional illustrations) by Benjamin A. Rifkin; a note on the text and the translations; prose summaries of the 114 poems by Hans Sachs; a verse translation of the 'Conclusion;' and an index of ranks and occupations." Bénezit, Emmanuel. Dictionaire critique et documentaire des peintres, sculpteurs, dessinateurs et graveurs de tous les temps et de tous les pays par un groupe d'écrivains spécialistes français et étrangers sous la direction de Jacques Busse. Nouv. ed. Paris 1999. Neue Deutsche Biographie. Berlin 1953ff. Pilz, Kurt. Die Zeichnungen und das graphische Werk des Jost Ammann 1539-1591 Zürich-Nürnberg. (Die Frühzeit 1539-1561). Zürich, 1933. Offprint from Anzeiger für Schweizerische Altertumskunde", Neue Folge, Band XXXV. Pilz, Kurt. Jost Amman, in Mitteilungen des Vereines für Geschichte der Stadt Nürnberg 37, 1940, 201 ff. Seelig, Gero. The New Hollstein German Engravings, Etchings and Woodcuts 1400-1700. Rotterdam, 2002.